GLAAD Media Award-winning film and TV producer JD Disalvatore (Shelter, Elena Undone) is crowdfunding a hugely important project. After seeing reports on the news about pets being surrendered to shelters due to a rash of foreclosures in the area, JD started volunteering at her local animal shelter. Being a filmmaker, she quickly started to use her skills to photograph and film the amazing animals and the inspiring people who cared for them. When she was diagnosed with stage IV breast cancer, JD did not slow down. 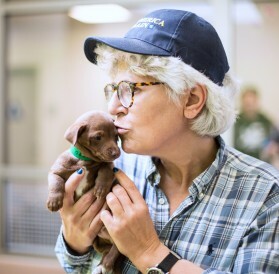 Putting on her activist hat, she launched an Indie GoGo for an ambitious and worthy project: a documentary film about East Valley Animal Shelter, highlighting the No-Kill movement that aims to stop the unnecessary euthanizing of hundreds of dogs and cats every year, and a series of free educational videos for social media. I caught up with JD to talk animals, inspirations and her plans for the project. One of the major aims of your film is to address the unnecessary euthanizing of unwanted animals. What is the “no kill” movement all about? Most times the city shelters don’t have the budgets we would like, and unfortunately the stray dogs and cats keep coming and coming. When there is no more room at a facility, that’s when they start to euthanize for space. The No Kill movement has been kick-started in Los Angeles by a big, wonderful organization called BEST FRIENDS. They are working with local shelter and rescues to brand NKLA (No Kill LA). This is a multi-tiered movement that involves all areas of animal rescue and care. And everyone is working on it! San Francisco is already a no-kill city, so I know we can do it. Many people who love animals avoid shelters as they imagine it will be too depressing. Do you hope to debunk such ideas with your film? I can’t speak for all shelters, but the city shelter where I have been volunteering for seven years — East Valley Animal Shelter in Van Nuys — we have tried our best to make it a clean, warm and welcoming place. Depending on where you are, the shelter experience will vary. If people are put off by the idea of going to a place where the animals might be euthanized, there are so many no-kill rescues in every town in America. But don’t discard the idea of going to your local shelter as this is where the need is the greatest for loving adopters. I don’t know that I can debunk any thinking on shelters, but I can honestly depict the shelters where I film, and hopefully that’ll educate and enlighten. In addition to the film, you are also producing free educational videos, what will these focus on? I’ve formed a volunteer/staff committee at the shelter where I volunteer, so we discuss and vote on projects like this there. We’ve already discussed and currently we are just starting Kitten Season, so the biggest need now will be a video about Bottle Feeder Fosters and kitten season. Last year, 29,000 cats were euthanized in LA County. So we have to get that number down. A lot of organizations are throwing a ton of money at this, and some exciting things are happening. So a good internet video will only help everyone’s efforts. Next, we have been examining our shelter and the trends there, and we believe a video about “How To Introduce Your New Dog or Cat to Your Pets” would be needed, as we get many returns based on this. We’ll also be making a wonderful How To Become a Dog/Cat Foster… I say wonderful because I just adore all our Foster Families at my shelter. They really save lives, and it can be so rewarding to be a pet foster. It is very admirable of you to take this on given your health status. Do you feel it’s therapeutic to be with animals and to fight for this cause? I’m sure my oncologist would freak out if he knew I was at a city shelter all the time, considering my minuscule white blood count, and all the germs and possibility of scratches and bites, but what the hell. You only live once. Yes. It’s hard to suddenly be handicapped and not be able to do all you could do before, especially if you were an active, type A film producer, but these animals don’t care. Sometimes all you have to do is go in a cage and comfort a scared, lonely dog or cat. I can certainly still do that. You must have met so many lovely, inspirational creatures on this journey, any in particular that stand out or that inspired you? The key for me is trying NOT to get attached to all the animals because they come and go so quickly. I’m currently in love with (and fighting for) a dog named Butch. Poor Butch, just no one wants him. I met him when I was doing a photo session when I tried to grab good shots of about 30 dogs. What struck me was that even though he’d been in medical for a month (it’s rather small and isolating back there, as it needs to be for them to heal) he was still a happy dog. He is a good boy. But again, they are all good boys. Then I found out he was in medical because he had CANCER. Which you know, explains perhaps the instant bond. Fortunately, the vet at the shelter removed many of his skin tumors and was able to remove all this cancer. 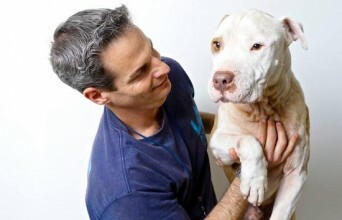 Butch was kept in a backyard for the four years of his life, and he is fair skinned. These backyard dogs, it’s like they have no idea what a real home is and they love love. Butch has been in the shelter since last August, and every day I pray they don’t put him down. He survived cancer, for god’s sake. There is no hope for me, but there’s hope for Butch. To learn more about JD’s work and support the How To Save A Dog project, visit her indiegogo page. Posted August 25th, 2016 & filed under Activism.